What do Londoners do when the sun comes out? They head to the roof tops of course! 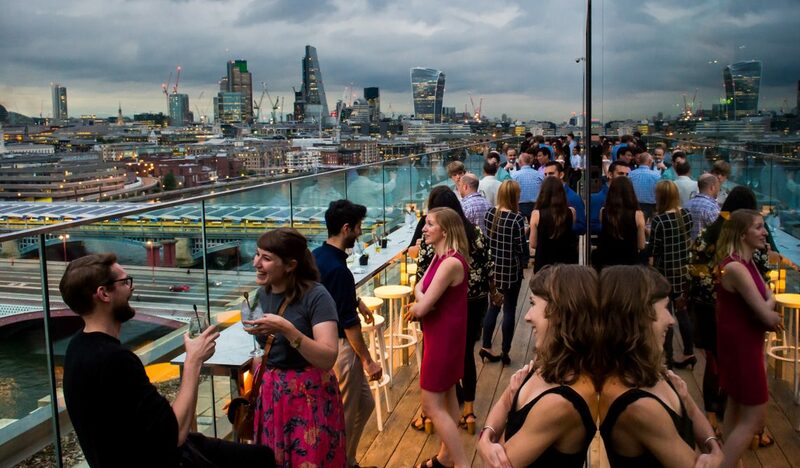 So what is it about roof top bars that inspire so many people to frequent their premises? The view is one obvious factor, as the higher you go the more of a stunning vista you can expect to see. But there’s also a sense of exclusivity about roof top bars, as if they are a well-known secret kept only by the chosen few, where membership is strictly limited. Inspired partly by the original party set of the 1920s, the ‘Bright Young Things’, expect glamour and opulent styling when you step into the Rumpus Room on the 12th floor of the Mondrian London building. You’ll see gorgeous, sumptuous seating areas with curved red leather couches, matched by comfortable swirl chairs covered in purple and red velvet, all presided over by giant chandeliers, and designed by Tom Dixon. With views of the River Thames, St Paul’s Cathedral and the skyline, visit at night or early morning for the best vistas. There are three venues that make up Aqua London in Soho. The Kyoto restaurant delivers modern Japanese cuisine as well as innovative dishes using a charcoal grill. The Nueva is the Spanish restaurant that is overseen by acclaimed chef Alberto Hernandez, and Aqua Spirit is the cocktail bar in-between. The two terraces that sit on top of the restaurants provide the setting for the Aqua Spirit roof top bar. You get plenty of space up there but be warned, the drinks are a little on the expensive side. Named after Nicholas Culpeper, this street level pub has a roof top garden where most of the herbs are grown for the busy kitchen downstairs. If a vibrant and busy vibe is your cuppa, then head for the top and drink concoctions that utilise the garden’s full potential, such as the Lemon-Thyme Ambrosia. The roof top bar opens at 5pm every night except for Mondays. In homage to the 150 year anniversary of the publishing of Lewis Carroll’s Alice in Wonderland, Proud have turned their roof bar into what could be described as a set from the book. Dive straight into the madness by enjoying cocktails served in teapots and playing with the Mad Hatter when he hosts a regular tea party, complete with croquet, every Saturday night. This is our largest roof top bar and if you are actually looking for somewhere to eat, probably our best suggestion for foodies. It serves food from four acclaimed restaurants – Salt Yard, Rabbit, Patty & Bun, and Le Coq. We love the large wooden tables that invite communal dining, and all situated underneath a canopy of natural foliage consisting of wisteria and bougainvillea (image the glorious smell in the summer) which makes you feel as if you are in a different world. There’s a roaming drinks cart, if you are too settled to get up and order from the bar, and you can play boules on one of the two courts.